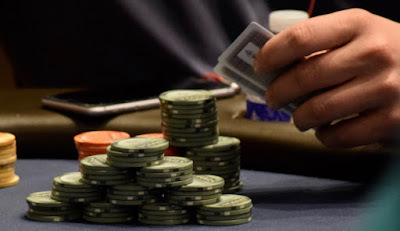 Just a bout time for Day 1A players to take an hour to go for dinner, so we went around the room and grabbed chipcounts from a handful of those still looking for a DAy2Bag. Registration for Day 1A closes at 730pm when cards go in the air for the start of Level 7. Day 1B kicks off tomorrow at noon and the final starting flight, Day 1C, goes Saturday at noon.